Iris is named for the Greek goddess of the rainbow, referring to the wide variety of flower colours found among the many species. Bearded irises, also known as Pogon irises, have stout surface rhizomes giving rise to fans of sword-shaped, usually broad leaves and simple or branched stems. These rhizomes must not be shaded by other plants but are tolerant of most soils, if well drained, and like full sun. A long, hot summer baking the rhizome will allow the plant to thrive and flower well. Iris ‘Godfrey Owen’ is a frilly flower with pale lemon standards (the upright petals) and white falls (the lower petals) that are edged with lemon. 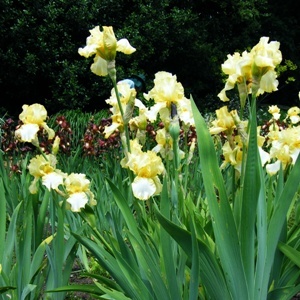 The beards (tufts of hairs on the lower petals that give these Irises their name) are bright yellow. The flowers have an intense lemon fragrance.